As the ultimate tilt-in-space wheelchair and one of the lightest in its field, the manual wheelchair Sunrise Medical Quickie Iris brings users the broadest range of positioning and caregiver options, allowing them to live without limits. As for Sunrise Medical, the global brand and one of the leaders in its field, they put great technology and engineering towards the creation of innovative mobility solutions. At Orthopedic Service Company, we are proud to offer these products as part of our catalogue to bring accessibility straight to you. Offering intelligent rotation-in-space wheelchair technology, the manual wheelchair Sunrise Medical Quickie Iris provides users with a smooth tilting motion that is easy to control. This technology means that the seat frame rotates around the user’s center of gravity, providing better maneuverability and rotation ranges that go from 40º to 60º for superior positioning. Its standard weight capacity holds up to 300 lbs, while the Heavy Duty goes up to 400lbs. With limitless seating and positioning capabilities, along with a JAY Lower Extremity Support that allows for vertical and horizontal angle adjustment for proper support, the Quickie IRIS’ versatility in design brings users the most comfortable experience possible. 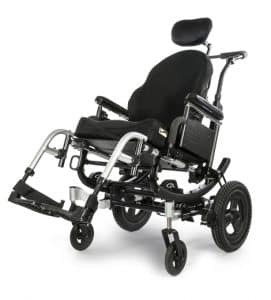 Overall, the manual wheelchair Sunrise Medical Quickie IRIS is meant to adjust to you by providing intuitive mechanisms and innovative technology made to fit the user and their specific needs. Offering a wide range of mobility solutions, part of our mission involves getting to know our customers and their specific needs. By visiting our showroom or giving us a call, you can talk directly to one of our mobility specialists. We’ll take the time to understand what your requirements are, the way you live your life and what it is that you actually need to help you in choosing a mobility solution that best fits you. Call today or visit our showroom and come test everything we have in store for you.